Be the first to share your favorite memory, photo or story of Thelma. This memorial page is dedicated for family, friends and future generations to celebrate the life of their loved one. 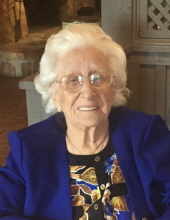 Thelma Davidson, 96, passed away in her home peacefully surrounded by her loving family on Friday, February 1, 2019. She was born on July 12, 1922 and was a life-long resident of the Hurley community. She was preceded in death by her husband, Charles “CD” Davidson; son, Jimmy Davidson; parents, Horace and Eula Mae Pierce; sisters, Velma Mahathy and Louise Smith; brother, Robert “Buck” Pierce; and grandson, Shane Chapuis. She is survived by her sister, Ida Eyrle “Ikey” Mahathy; two sons, Charles (Dot) Davidson and Alton (Gail) Davidson; nine daughters, Edna (Dickie) Chapuis, Linda (Lewis) Yawn, Nancy (Charlie) Churchwell, Carol (Mike) Pierce, Judy (Wayne) McDonald, Alice (Mike) Jones, Marie (Kennith) Mallette, Kim (Kenny) Goss, and Janet (Scott) Kennedy; twenty-five grandchildren; fifty-five great-grandchildren; six great-great-grandchildren; along with many nieces, nephews, other relatives, and many friends. Memories of her will be cherished by all. The visitation for Thelma will be held on Sunday, February 3, 2019 from 1:00 p.m. until 3:00 p.m.at Roberts Chapel United Methodist Church. The funeral service will follow at the church beginning at 3:00 p.m. Interment will be in the church cemetery with Kenneth Smith, Jubal Pierce, Arnold Mahathy Jr., Cecil “Shorty” Davidson, Gene Davis, and Winfred Tanner serving as pallbearers. Heritage Funeral Home, locally owned and operated in Escatawpa/Moss Point, MS is in charge of arrangements. To send flowers or a remembrance gift to the family of Thelma Davidson, please visit our Tribute Store. "Email Address" would like to share the life celebration of Thelma Davidson. Click on the "link" to go to share a favorite memory or leave a condolence message for the family.